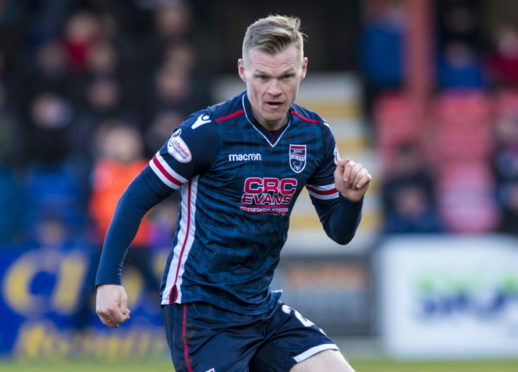 Billy Mckay netted twice for Ross County. Ross County suffered a humiliating 4-1 defeat against League 1 side Arbroath in their Betfred Cup encounter at Gayfield. County had taken the lead midway through the first half courtesy of Billy Mckay, however a hat-trick from Michael McKenna and a Kane Hester strike saw Arbroath run out comfortable winners, with Staggies midfielder Tony Dingwall also dismissed for simulation. Despite the result, County will still progress to the second round as Group A winners if they defeat Alloa Athletic on Saturday. County made six changes from the side that defeated Dundee United 1-0 in their last outing the previous week. Defenders Liam Fontaine and Marcus Fraser were absent through injury, while Declan McManus, Josh Mullin, Jamie Lindsay and Ross Draper dropped to the bench. Iain Vigurs captained the Staggies in his first appearance since returning from Caley Thistle this summer, while there was also a debut for defender Stelios Demetriou, and starts for Tony Dingwall, Dylan Dykes, Ryan Dow and Callum Morris. Arbroath started the match brightly, hitting the post on 22 minutes through Omar Kader’s powerful strike, however County netted the opening goal on the break just 60 seconds later, with Dingwall slipping the ball through for Mckay to shoot low past advancing goalkeeper Darren Jamieson. The Red Lichties came close to cancelling out the Staggies’ lead moments later though, with Michael McKenna seeing an effort well held by Scott Fox, whose opposite number Jamieson did well to make saves from Michael Gardyne and Mckay towards the end of the half. Arbroath restored parity on 43 minutes however, when referee Steven Kirkland pointed to the spot after Demetriou had fouled Danny Denholm, with McKenna calmly sending Fox the wrong way. County were dealt a further blow on 57 minutes when Dingwall was dismissed for a second booking after Kirkland penalised him for diving. Arbroath took full advantage within three minutes, with Ryan Wallace initially denied by Fox from long-range, however the resulting corner from Denholm saw Wallace’s flick-on turned home by McKenna. County looked for a response, with McManus bulleting a header over from fellow substitute Jamie Lindsay’s cross. McKenna sealed his hat-trick on 72 minutes after getting on the end of Hamilton’s header, before Hester’s superb finish compounded a miserable night for the Staggies.